Manley 11353-8 Race Master Valves Pontiac 400-428-455 11/32 Stem Dia. Manley 11355-8 Race Master Valves Pontiac 400-428-455 11/32" Stem Dia. Manley 11808-8 Race Master Valves Small Block Chevy 11/32" Stem Dia. Manley 11812-8 Race Master Valves Small Block Chevy 11/32" Stem Dia. 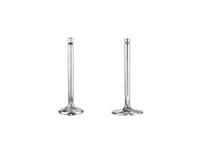 Manley 11872-8 Race Master Valves Big Block Chevy 11/32" Stem Dia. Manley 11873-8 Race Master Valves Ford 351C 11/32" Stem Dia. Manley 11875-8 Race Master Valves Ford 429 / 460 11/32" Stem Dia. Manley 11881-8 Race Master Valves Big Block Chevy 11/32" Stem Dia.